At the end of the first theoritical class, we had a practical session on how to handle a DSLR camera and take good photos with great composition. The partcipants were all asked to apply the knowledge learnt and composition, angle and exposure triangle to take photos which were later subjected to a photo critique in the class. The training participation was fair of selection which was done base on the commitment and driven motivation behind the applicant’s interest to participate in the training. A total of 49 applications with less than 5 female applicants were received through the created Google docs form. An application was further sent to a more female audience in a bid to balance the gender gap. After that, 7 female participants were invited to participate but only 4 were able to make it. 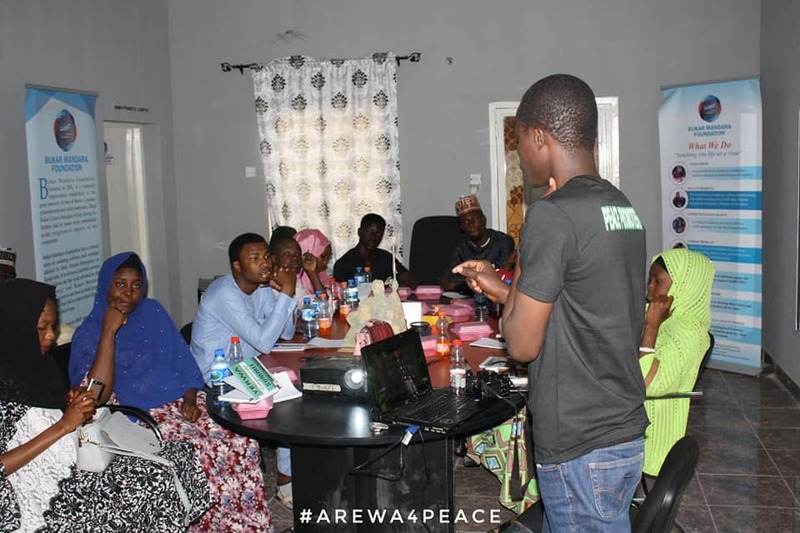 A total of 15 participants attended the theoretical and practical based training including Mohammed Ibrahim, a Peace promoter. It was such an interactive session where everybody was given the opportunity to express themselves and contribute to the class. The training started at 9; 00am and we had a tea break at 11; 30am and a lunch break at 1; 30pm. After the training at 4; 00pm, we had a group picture and selfie shoots. A whatsapp group was created with all participants added to keep a network of sharing our knowledge and improving our skills. In the subsequent activities of the fellowship, the team will work with these participants to expand the reach of our storytelling.